Muppet-skin hats were very popular in the mid 1600's. Blood thirsty bands of club-wielding poachers would descend upon the muppet rookeries and beat the young muppets to death. The limp, lifeless muppets were then skinned and their violated bodies left to rot. The extreme viciousness of these attacks stands in stark contrast to the vain, primping women (as depicted in this painting) who would then drape the soft muppet fur about their bodies or wear them on their heads. Fortunately, synthetics were eventually able to mimic the look and feel of muppet fur and the muppets were saved from extinction. Muppets have since made a remarkable recovery and a stable population of them now exists in New York. Vermeer was a great champion and defender of the Muppets and this painting was meant to highlight their desperate plight and to shame those who's vanity drove the bloody slaughter of these innocent creatures. 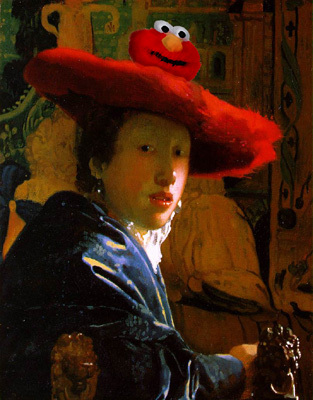 We owe Vermeer a great debt of gratitude, for without his valiant efforts, the great intellectual contributions of todays muppets would not have been possible.